These pretty one was ready to go … last minute snap, not the best quality photos but I’m soooo happy I took this shot !!! 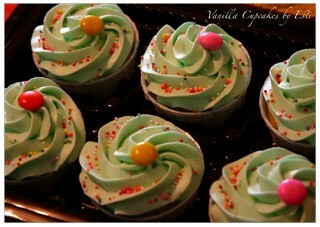 They were vanilla cuppies with vanilla buttercream for Leah Hubby, half an hour after I sent them out for delivery my lunch guests were arriving in our home … pheeewww .. that was close ! This entry was posted in cameraholic, Cupcakes, pin - up and tagged vanilla. Bookmark the permalink.